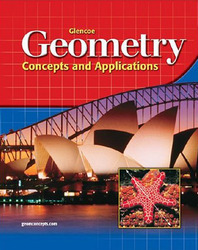 Geometry: Concepts & Applications ©2004 covers all geometry concepts using an informal approach. The Student Edition maintains algebra 1 content throughout and every concept is connected to real-world applications. Plus, teachers have the option to cover geometric proofs in Chapter 15. Geometry: Concepts & Applications uses a clean lesson design with many detailed examples and straightforward narration that make geometry topics inviting and geometry content understandable. Chapters 1-14 and 16 offer comprehensive coverage of geometric concepts without the rigor of proof. Chapter 15 deals with formal proof. Reading Geometry; Words, Symbols, and Models; and Communicating Mathematics help your students become proficient in reading geometry. InfoGraphics convey information visually, reducing the student's reading load. Glencoe's Assessment Advantage includes Preparing for Standardized Tests, created in conjunction with The Princeton Review. Two-page reviews present strategies for solving problems that appear on standardized tests and proficiency tests. Each exercise also ends with a Standardized Test Practice problem. Algebra content is integrated at the point of use. Your Turn exercises appear after each skills-related example, giving students the opportunity to practice what was presented in the example before they move on in the lesson. Each chapter contains four Internet Connections: Data Update, Test Practice, Review Activities, and Research. Student Handbook in the textbook contains Algebra Review, Extra Practice for every lesson, and a TI-92 Tutorial.